Don't feel bad if you didn't know where Namibia was before this week. You probably haven't had a reason to! 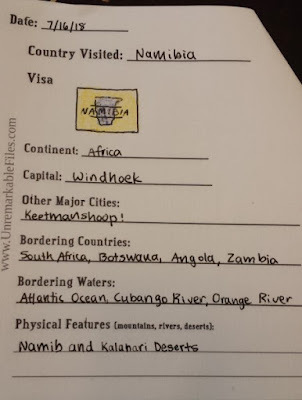 My kids put Namibia on our itinerary of world countries to learn about this summer and I'm not going to lie, it wasn't easy to find resources on the second-most sparsely populated country on Earth. But with a little determination and inter-library loan, anything is possible. Some of the links in this post are affiliate links. This means I may earn a small percentage of your purchases as commission if you buy anything. Like a mattress salesman, but with less hovering when you're trying to pull the trigger on your decision. 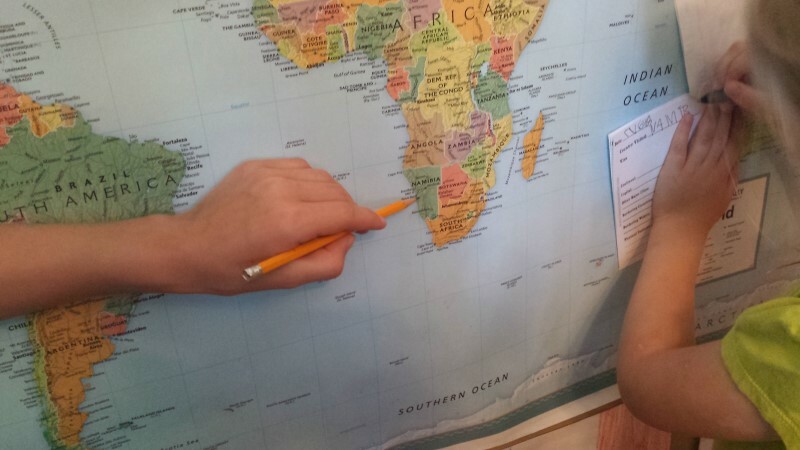 The kids found Namibia on the map and filled out their passport pages. When I started doing this, all the kids were little and needed help, and now I have a middle-schooler who knows more about geography than I do. These passport pages have been a great help to us during The Educational Summer Vacation and you're welcome to download and use them for free. Click to download blank sheets. In the early years I used to bind the passport pages in a book with an official-looking cover and personalize each one with that kid's picture; these days I print out a stack and staple at the corner. 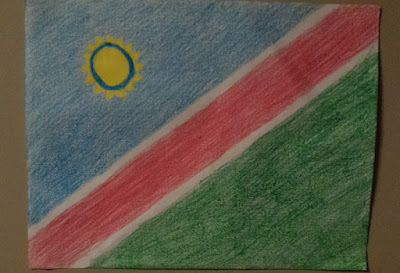 Flag of Namibia: crayon, 2018. While the kids researched and drew the flag of Namibia, we listened to the national anthem. The Namibian national anthem is one of the prettiest ones I've heard so far. This was news to me, but Namibia used to be a German colony called German South West Africa. Who knew?? 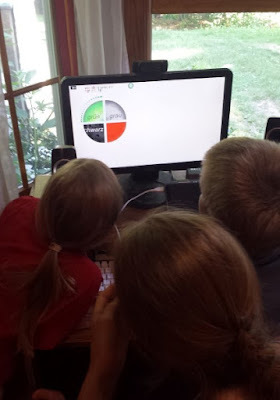 So we reviewed how to say please and thank you in German (which I reminded the kids to many eye-rolls that I expected them to use at dinner,) and then watched this German numbers video on YouTube. I put this German Picture Dictionary for Kids on the coffee table, and because my older kids are incorrigible bookworms who will read anything left within their reach (up to and including appliance user manuals,) I knew they'd pick it up and look at it. My kids were thrilled that color names in German are pretty similar to their English counterparts. We also read I Am Lutheran and the kids wanted to know why there are so many names for what we call the sacrament: the Lord's Supper, holy communion, eucharist... I have no idea. There just are. The Namib Desert runs up and down the entire Atlantic coastline of Namibia, and the way the dunes come right up to the ocean is really incredible. We read some information on the Namib desert in particular here, and checked out the book Sand Dunes by Peggy J. Parks. Despite its not-at-all riveting title, it was fascinating! 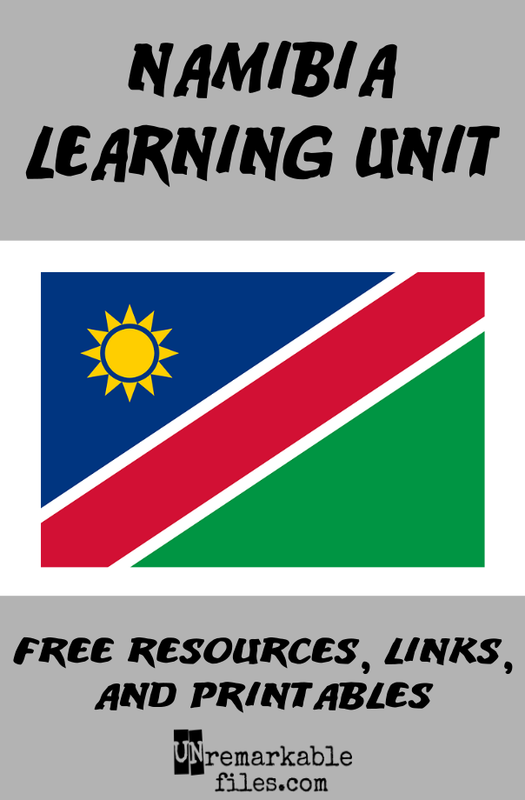 It told us a lot we didn't know about the Namib, and after we finished the kids were all excited about looking up the things we read about. Maybe it was the strings music in the background, but this video made me legitimately start tearing up at how beautiful the world is. After reading the first page of Survival! Desert (a Time for Kids book) so the kids would be interested in picking it up on their own later, we moved to the porch with two trays full of flour and some drinking straws to practice forming our own sand dunes. 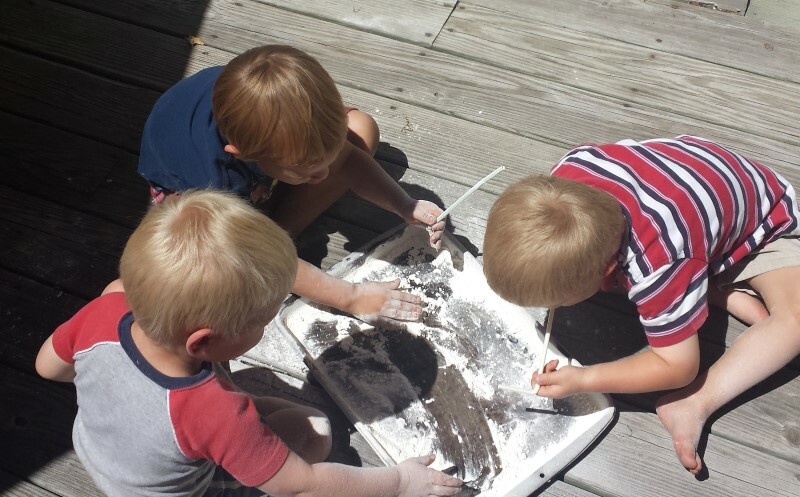 The older kids discovered it took time and patience to form a sand dune. The little kids (plus a toddler we were babysitting for the day) had a blast blowing around the flour and all ended up looking like Father Time. Had zero idea what we were doing or why, but they were totally into it anyway. If you do this at home, remember to reserve the honor of cleaning up afterward for the best-behaved child of the day or week, and let them blow it all off with a Shop-Vac set in reverse. They'll love it. We watched a movie I found at the library called Magic Journey to Africa. Frankly, I've heard more coherent storylines when my kids insist on recounting their dreams in the morning, and the CGI and the acting was a solid D, but we saw the Namibian landscape and my 6-year-old liked the flying Pegasus. 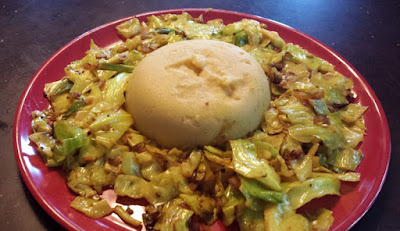 For dinner I made cabbage and pap, which wasn't super-flavorful but not horrible, either. I really did want to like it, though, because it was soooooo easy. Pap is the stuff in the center and is served with just about every meal in Namibia. 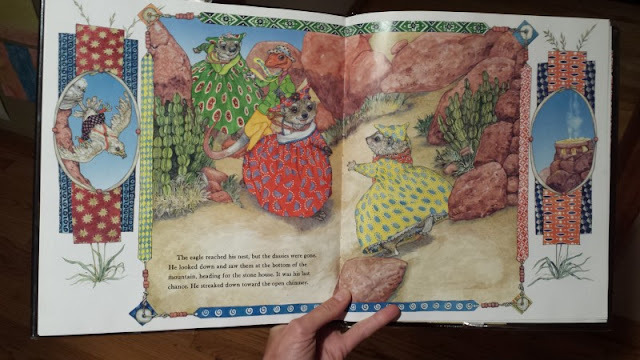 At bedtime I read The 3 Little Dassies by Jan Brett. It's an African version of the three little pigs inspired by her trip to Namibia. Even if you don't know Jan Brett's name, you'd know her distinctive illustrative style when you saw it. To be honest I wasn't sure we could fill up an entire week talking about a sparsely-populated country I knew nothing about, but I shouldn't have been worried because Namibia is a fascinating place and we barely scratched the surface. Now I know better.